In Berlin’s Neues Museum, Akhenaten’s bust bears the scars of upheavals ancient and modern. Smashed by the king’s successors in the 14th century B.C., it was also damaged as a result of being moved during World War II. The skeleton belonged to a child who lived at Amarna more than 3,300 years ago, when the site was Egypt’s capital. The city was founded by Akhenaten, a king who, along with his wife Nefertiti and his son, Tutankhamun, has captured the modern imagination as much as any other figure from ancient Egypt. This anonymous skeleton, in contrast, had been excavated from an unmarked grave. But the bones showed evidence of malnutrition, which Shidner and others have observed in the remains of dozens of Amarna children. Until recently Akhenaten’s subjects seemed to be the only people who hadn’t weighed in on his legacy. Others have had plenty to say about the king, who ruled from around 1353 B.C. until 1336 B.C. and tried to transform Egyptian religion, art, and governance. Akhenaten’s successors were mostly scathing about his reign. Even Tutankhamun—whose brief reign has been a subject of fascination since his tomb was discovered in 1922—issued a decree criticizing conditions under his father: “The land was in distress; the gods had abandoned this land.” During the next dynasty, Akhenaten was referred to as “the criminal” and “the rebel,” and pharaohs destroyed his statues and images, trying to remove him from history entirely. Archaeologists always tried to resist such interpretations, but key pieces of the puzzle were missing. Much study of Amarna has focused on elite culture: royal sculpture and architecture, and inscriptions from the tombs of high officials. For years scholars hoped for the opportunity to study the burial places of common people, knowing that Amarna’s brief window of existence—17 years—meant that a cemetery would provide a rare snapshot of everyday life. But it wasn’t until the early 2000s that a detailed survey of the surrounding desert finally located evidence of four separate cemeteries. After the discovery, archaeologists and bioarchaeologists spent nearly a decade excavating and analyzing the largest of these cemeteries. They collected a sample of skeletons from at least 432 people, and their findings were grim. Of the burials where age at death was known, 70 percent of the individuals had died before reaching 35, and only nine appear to have lived beyond 50. More than one-third were dead before they turned 15. The growth patterns of children were delayed by as much as two years. Many adults had suffered spinal damage, which bioarchaeologists believe is evidence that people were being overworked, perhaps in order to build the new capital. The ancient king continues to be the subject of monumental art, including this sculpture at Minia University. In 2015 the team proceeded to another cemetery, to the north of Amarna, where they excavated 135 bodies. Anna Stevens, an Australian archaeologist who directs the cemetery fieldwork, told me that excavators soon noticed something different about these burials. Many of the bodies appear to have been buried hastily, in graves that contain almost no goods or objects. There isn’t evidence of violent death, but family groupings seem to have broken down; in many cases it looks as if two or three unrelated people were tossed together into a grave. They were young—92 percent of the individuals in this cemetery were no older than 25. More than half died between the ages of seven and 15. For Akhenaten, Amarna represented something pure and profoundly visionary. “No official has ever advised me concerning it,” the king wrote proudly of his founding of the brand-new capital city. He chose the site, a broad stretch of virgin desert above the east bank of the Nile, because it was uncontaminated by the worship of any god. He also may have been motivated by the example of his father, Amenhotep III, who was one of the greatest builders of monuments, temples, and palaces in Egyptian history. Both kings were part of the 18th dynasty, which came to power after defeating the Hyksos, a group from the eastern Mediterranean that had invaded northern Egypt. The forefathers of the 18th dynasty were based in southern Egypt, and in order to drive out the Hyksos, they incorporated key innovations from their enemy, including the horse-drawn chariot and the composite bow. The Egyptians professionalized their military, and unlike most previous dynasties, the 18th maintained a standing army. They were also skilled at diplomacy, and the empire eventually stretched from current-day Sudan to Syria. Foreigners brought new wealth and skills to the Egyptian court, and the effects were profound. Under Amenhotep III, who ruled from around 1390 to 1353 B.C., the style of royal art shifted in ways that would be described today as more naturalistic. Even as Amenhotep III welcomed new ideas, he was also looking back to the distant past. He studied the pyramids of kings who had lived more than a thousand years earlier, and he incorporated traditional elements into festivals, temples, and royal palaces. He continued to worship Amun, who was the patron god of the city of Thebes. But Amenhotep III also began to emphasize Aten, a form of the sun god Re, portrayed as a solar disk, that recalled older patterns of worship. The king’s son took the throne as Amenhotep IV, but during the fifth year of his reign he made two momentous decisions. He changed his name to Akhenaten—Devoted to Aten—and he decided to move the capital to the site now known as Amarna. The king called his city Akhetaten, or Horizon of the Sun Disk, and soon this stretch of empty desert became home to an estimated 30,000 people. Palaces and temples were built quickly, at astonishing scale—the Great Aten Temple, the city’s largest ritual complex, was nearly a half mile long. Meanwhile Egyptian art was also being revolutionized. For centuries strict traditions had defined the correct subject matter, proportions, and poses of paintings and sculptures. Under Akhenaten, artisans were unleashed from these guidelines. They created lifelike, fluid scenes of the natural world, and they began to portray Akhenaten and his queen, Nefertiti, in unusually natural and intimate poses. Often the royal couple would be shown kissing and caressing their daughters; one scene even featured the king and queen about to get into bed together. The portrayal of Akhenaten’s features seems designed to shock: massive jaw, drooping lips, and elongated, otherworldly eyes. In the king’s vision, religion became radically simplified. Egyptians worshipped as many as a thousand gods, but Akhenaten was loyal only to one. He and Nefertiti functioned as the sole intermediaries between the people and Aten, taking on the traditional role of the priesthood. Nefertiti was named co-regent, and while it’s unclear whether she wielded political power, her religious and symbolic status was highly unusual for a queen. All of this must have threatened priests of the old order who served Amun. After a few years at Amarna, the pharaoh ordered work crews to gouge out all images of Amun in state temples. It was an act of unbelievable boldness: the first time in history that a king had attacked a god. But revolutions have a way of turning against their greatest enthusiasts, and this violence eventually would consume Akhenaten’s own creations. I arrived at the site of the Great Aten Temple one day just as Barry Kemp found a piece of a broken statue of Akhenaten. Kemp is a professor emeritus from Cambridge University who directs the Amarna Project, and he’s worked at the site since 1977. He’s spent more than three times as many years digging through the city’s ruins as Akhenaten spent building it. “This is beautifully made,” he said, holding up the piece of carved stone statuary, on which only the king’s lower legs were visible. “This is not accidentally damaged.” Amarna archaeology has a forensic quality because so many artifacts were deliberately destroyed after the sudden death of the king around 1336 B.C. His only son and heir was Tutankhaten, no more than 10 years old, who soon replaced the “Aten” in his name with the title of the god that his father had hated: Tutankhamun. He abandoned Amarna and returned to the old traditions. Tutankhamun died unexpectedly, and soon the head of the army, Horemheb, declared himself pharaoh—possibly the first military coup in history. Horemheb and his successors, including Ramses the Great, dismantled Amarna’s royal buildings and temples. They destroyed statues of Akhenaten and Nefertiti, and they omitted the names of the heretic king and his successors from official lists of Egyptian rulers. This act of damnatio memoriae was so successful that it was one of the reasons Tutankhamun’s tomb escaped significant looting in the Valley of the Kings. Tut’s tomb may even contain further secrets—during the past year archaeologists have been investigating signs of possible hidden doorways in two walls of the burial chamber. In pharaonic times generations of looters usually combed through such tombs, but Tut’s was largely left intact. People simply forgot that it was there. Egypt’s two primary capitals in centuries past were the strategic and religious centers of Memphis and Thebes. But Akhenaten built a new capital, Amarna, on an isolated patch of desert, signaling a break from Egypt’s religious and ideological past. They also forgot most details of Amarna life. Kemp’s recent excavations have shown that the Great Aten Temple was destroyed and rebuilt sometime around Akhenaten’s 12th regnal year. The piece of statuary that he showed me dated to this event—it had been shattered at the command of the king himself, not his successors. But other evidence is often remarkably intact. Ancient settlement sites were usually located in the Nile Valley, where millennia of floods and habitation destroyed original structures. In contrast, Amarna is situated in the desert above the river, where drinking water had to be hauled in. This was why the site was uninhabited before Akhenaten, and it’s why it was abandoned so completely. Even today you can still see the original brick walls of Amarna houses, and broken pottery is everywhere. It’s possible to visit the 3,300-year-old building where the famous painted bust of Nefertiti was excavated by a German archaeological team in 1912. Kemp told me that he was originally attracted to Amarna by the intact city site, not the outsize figure of Akhenaten. He believes that too many modern characteristics have been ascribed to the king, and in Kemp’s opinion, even the word religion is “mischievous” when applied to ancient Egypt. Like most scholars nowadays, he does not describe Akhenaten as a monotheist. The word is too charged by subsequent religious traditions, and during Akhenaten’s reign most Egyptians continued to worship other gods. The danger of being an absolute ruler is that no one dares tell you that what you have just decreed is not a good idea. Johnson has recently pieced together broken wall reliefs and statuary from collections scattered all around the world. Digitization makes work like this faster. Johnson showed me a virtual “join” in which he had matched a photograph of one fragment located in Copenhagen with another in the Metropolitan Museum of Art. “They’re 4,000 miles apart, but I realized that they join,” he said. The connection reveals a surprising scene: Akhenaten performs a ritual not with Nefertiti, but with Kiya, another wife, who didn’t have the status of queen. A small number of scholars are involved in such work, and the ones I met seemed to have a softer view of Akhenaten, perhaps because of intimate contact with the art. This proved to be the king’s most lasting legacy, at least until his rediscovery in modern times. His city and his ritual practices were quickly abandoned, but the Amarna artistic style influenced subsequent periods. Marsha Hill, a curator at the Metropolitan Museum of Art, told me that handling Amarna’s sculpture fragments makes her feel more positive about Akhenaten. For villagers in Amarna, life still revolves around the Nile River. In ancient times Akhenaten founded his capital city on a stretch of desert just above the east bank. The site became home to royal palaces, temples, and workers’ dwellings, but farmers tilled land across the river, where the lower banks were inundated by annual floods. To this day most farming settlements are on the western bank of the Nile. Egypt’s modern revolution has made it even harder for archaeologists to study the scattered and shattered evidence of Akhenaten’s reign. In February 2011 protests on Cairo’s Tahrir Square forced the resignation of President Hosni Mubarak, who had ruled for nearly three decades. In 2012 Egypt held its first ever democratic presidential election, which was won by Mohamed Morsi, a leader of the Muslim Brotherhood. But after just a year in office he was removed by a military coup. In the aftermath of this event, security forces massacred hundreds of Morsi supporters in Cairo. 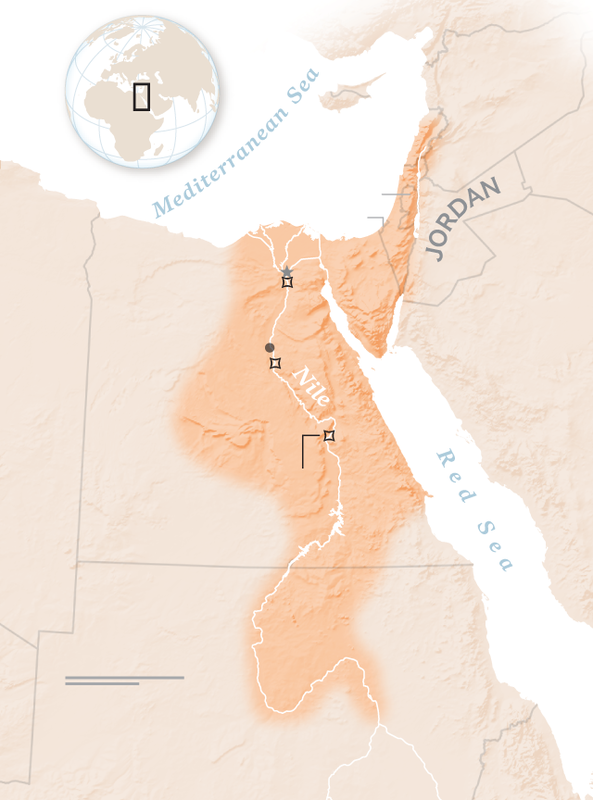 Protests raged across the country, including in Mallawi, a city across the Nile from Amarna. In August 2013 a local mob of Morsi supporters attacked a Coptic Christian church, a government office building, and the Mallawi Museum. During the violence the museum’s ticket taker was killed and every portable artifact was stolen—more than a thousand in all. Since then the police have recovered most of the pieces, but it took three years for the museum to reopen. The revolution also halted construction of the Aten Museum, the most impressive building in Minya. Designed by German and Egyptian architects, the modernist structure rises nearly 200 feet beside the Nile, in a shape reminiscent of a pyramid. In all of Egypt, Akhenaten is the only pharaoh who is still being honored by the creation of monumental architecture. It’s a testament to the fact that the country’s Muslim leaders embrace Akhenaten’s popular identity as a monotheist, but nevertheless his legacy can’t seem to escape political upheaval. More than $10 million was spent on the museum before the funding abruptly ended, a victim of the post-Tahrir economic collapse. One day I visited the site and found 11 employees sitting in a darkened office with the air-conditioning off. Outside it was 109°F. Mohammed Shaben introduced himself as the museum’s IT manager and apologized for the heat—they had no electricity. I asked what an IT manager does without electricity. He was 26, and most of the others were even younger. All were educated: curators, interior designers, restoration specialists. In Egypt about 60 percent of the population is under the age of 30, and young people dominated the Tahrir protests. They’ve also paid the highest price for the revolution’s failure. Since the coup there’s been a brutal crackdown on dissent, and Egyptian jails are home to tens of thousands of political prisoners, many of them young. Nearly a third of the country’s youth are unemployed. Shaben told me that he and other government employees were required to come and sit idly every day, despite the fact that construction on the facility had halted. He gave me a tour of the museum, which featured five floors, 14 exhibition halls, and a theater, everything unfinished and open to the elements. A pack of stray dogs had taken up residence inside the museum; the site was strewn with tiles, rebar, and rusting air-conditioner ducts. “Look out for the bats,” Shaben said, when we entered the theater. He told me that someday it will seat 800. Amarna art portrayed Akhenaten giving prizes to sycophants and parading around with deferential bodyguards. A young antiquities inspector named Ahmed Gaafar accompanied us, complaining that the political upheaval had stymied his career as a curator. This pattern seems eternal, from the graves of Amarna to the frustration of Tahrir: In every time and in every place, revolutions eat the young. Gaafar mentioned Egypt’s recent presidential election, which had been won by Abdel Fattah el-Sisi, the general who had led the coup that ousted Morsi, the Islamist leader. Gaafar saw a connection between this coup and Akhenaten’s era. That sentiment—preparing Egypt to be great again—is far older than Sisi or even Akhenaten. In ancient Egypt, after periods of weakness or disunity, leaders often declared a wehem mesut, literally “repeating a birth”—a renaissance. They turned to ancient symbols as a way of using past glories to promise future success. Tutankhamun declared a wehem mesut, and it seems Horemheb may have as well. And the strategy continues today. Revolutions gain legitimacy if they’re connected to the past, which is why Tahrir slogans were often accompanied by images of Gamal Abdel Nasser and Anwar Sadat. It’s also why marginalized groups around the world, ranging from gay-rights activists to Afrocentrists, have gravitated to the figure of Akhenaten. Mamdouh Abu Kelwa sails his felucca past the unfinished Aten Museum in Minya. Akhenaten needed only five years to build a new capital; the 25-acre museum complex has taken more than twice as long because of political and economic instability. Since the project began, Egypt has undergone a revolution and a coup, and two former presidents have been put on trial. In her view a revolution is an act of selective storytelling. “Akhenaten is creating a narrative,” Stevens said one day in her office. And then she pointed to an image of skeletons from a commoners’ cemetery. “But this narrative isn’t for these people, really.” Their stories will never be fully known, in the same way that the lives of most contemporary Egyptians are ignored when we focus on the dominant figures of national politics: Mubarak, Morsi, and Sisi. If we find it hard to capture the full range of revolutionary experiences during the past six years, what are the odds that we can truly understand the politics of the mid-14th century B.C.? Peter Hessler lived in Cairo from 2011 to 2016 and is now working on a book about archaeology in Egypt. Rena Effendi shoots human-interest stories around the world. This is her third story for the magazine.